Those tabloid journalists, Upsher and Doff, are hard at work— none the worse for wear after last issue's sniper attack. They interview a bat-winged Special Agent Gale, who's none too pleased to see them. He invites them in to speak in private, and begs them not to run their story; spinning some bull about Alana being deep undercover. Curiously, he plays the gay rights activist card. Apparently, homosexuals aren't welcome on Jetsam, which may explain why two upstanding gentlemen of integrity are working for a tabloid. It's the best work they could find. No sooner are the newsboys out the door, than Agent Gale calls our favorite Seahorse, requesting a swift assassination. The Will's MIA, but Erving has a contact in case of emergencies: The Brand. How's that for a hook? On Quietus, Heist reads Hazel a grim fairy tale, while his other guests read their own selections. (Reading's fundamental, folks!) Heist breaches the topic of the Open Circuit, a renegade acting troupe rife with superhero costumes and horrible clichés. It's a broad, tawdry soap opera... and a possible outlet for Alana to find work. They return to the ship, to find Sophie stomping on The Will's open neck wound. Gwen fends off Lying Cat, who's ready to rip Sophie to pieces, and ties up the girl before she can hurt them or herself. So, new urgency: The Will needs a healer fast, and the only one Gwen knows in reach... is Marko. They're off to Quietus, but quick. Klara and Oswald discuss the pros and cons of warfare— failing to see eye to eye— when Heist retreats upstairs to find a book for her. Izabel arrives to talk up the prospect of Klara and Oswald K-I-S-S-I-N-G, but the moment is interrupted... by Prince Robot IV. He gets a garbled call from his wife, heavy with child. He loses the connection before he can say anything of importance, and continues on his way to Oswald's lighthouse. Watching from a nearby cliff, are Gwen and Lying Cat. Damn. Things are going to get ugly— or rather, go back to the ugliness we've already seen before this interlude caught us up. 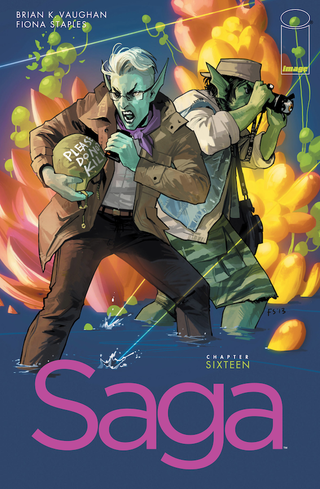 Brian K. Vaughan certainly knows what he's doing, and Fiona Staples' work is gorgeous. The pieces have moved themselves into place. I care about the characters (except maybe Klara), so whatever happens next, it'll be bad for someone. Come back soon. There's bad tidings afoot.